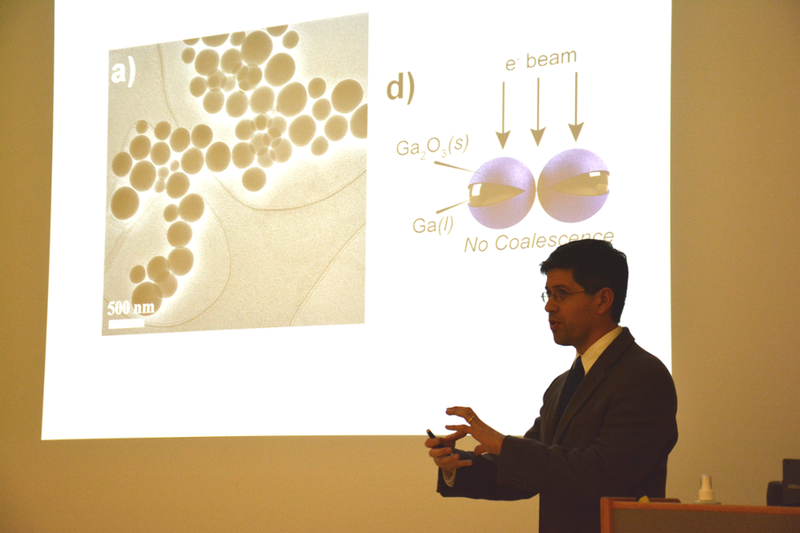 Dr. Stephen Maldonado, from the University of Michigan, recently presented his work on semiconductor electrochemistry during a colloquium hosted by the Auburn University Department of Chemistry and Biochemistry. Auburn University Chemistry Professor and Department Chair Dr. Curtis Shannon has known Dr. Maldonado since he was a post-doctoral scholar at the California Institute of Technology. “I think he’s really doing some of the nicest work in electrodeposition going on in research today, so I’m excited that he’s finally here,” Dr. Shannon said while introducing Dr. Maldonado. Dr. Maldonado said his early work was largely inspired by Dr. Shannon’s work in semiconductors. Dr. Maldonado’s current work relates to the idea of using electrochemistry to synthesize semiconductor materials. University of Michigan's Dr. Stephen Maldonado speaks at Auburn University during a Chemistry Colloquium.